The United States Congress designated the Paria Canyon-Vermilion Cliffs Wilderness (map) in 1984 and it now has a total of 110,816 acres. Arizona contains approximately 89,400 acres. Utah contains approximately 21,416 acres. It is managed by the Bureau of Land Management. This colorful Wilderness snakes through northern Arizona, northeast along the gorgeous Vermilion Cliffs and swings northwest along the not-to-be-missed Paria Canyon before eventually leading into Utah, where a much smaller portion of the area is preserved. Paria Canyon is considered one of the best canyon-backpacking destinations in the world. Soaring walls are streaked with desert varnish, and serpentine canyons are so narrow in places that the sky is reduced to a ribbon of faded blue. Vast red-rock amphitheaters, sandstone arches, intricate erosion-carved sculptures, woodland terraces, and hanging gardens of ferns and orchids are found here. Common wildlife includes mountain lions, bighorn sheep, porcupines, beavers, rattlesnakes, red-spotted frogs, bald and golden eagles, violet-green swallows, and great blue herons. The heart of the earth is laid bare in this region and compels visitors to return again and again. Beyond the canyon, the Vermilion Cliffs, massive and multicolored, rise as much as 3,000 feet, an escarpment dominating the rest of the Wilderness with its thick Navajo sandstone face, boulder-bound slopes, and rugged arroyos. Elevations within the Wilderness range from 3,100 to 7,100 feet. The main canyon is usually entered from the Utah end of the Wilderness at the White House Trailhead, but some backpackers choose the more laborious Buckskin Gulch route. This canyon is about 12 miles long and enters Paria approximately seven miles from White House. At some points, the route narrows to only three feet in width. A 30-foot climb down a rock jam is required before entering Paria Canyon. Flash floods may cause a 20-foot wall of water to pour down Buckskin. To safely travel Buckskin, an accurate weather forecast is a necessity. The most popular times to visit the Wilderness area are in the spring and fall. Even winter temperatures can often be appropriate for hiking. During the summer, however, temperatures can be sweltering and can make for extremely difficult hiking conditions. One should be cautioned, too, as water is unavailable in some of the areas. Temperatures range from 60 to 100 degrees Fahrenheit in the summer and from 20 to 45 degrees in the winter. Only a few inches of rainfall, annually. 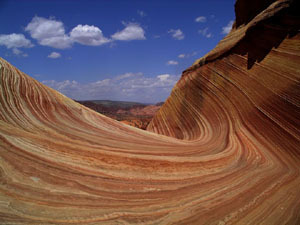 Planning to Visit the Paria Canyon-Vermilion Cliffs Wilderness? How to follow the seven standard Leave No Trace principles differs in different parts of the country (desert vs. Rocky Mountains). Click on any of the principles listed below to learn more about how they apply in the Paria Canyon-Vermilion Cliffs Wilderness.